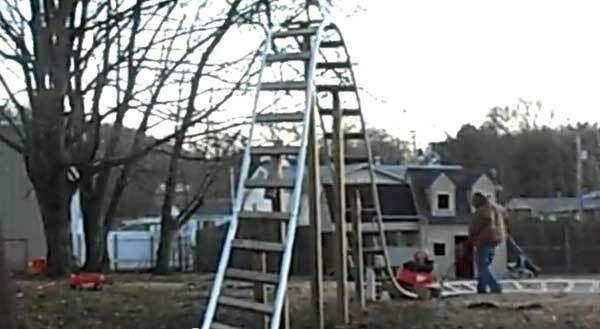 Tree swings and see saws are awesome and if you’ve got a skate ramp in your backyard you’re probably the most popular house on the block but if you and your kids are adrenaline junkies, the next logical step is a backyard roller coaster. We don’t condone these contraptions but we are in awe of the spirit and know how of these homegrown engineers. Wood, metal, PVC and in-depth knowledge of physics are all you need to get started. The kids certainly look like they are having fun riding these and thats the most important thing. Strange we don’t see anyone wearing a helmet but if you are building a backyard roller coaster, safety might not be at the top of your list.